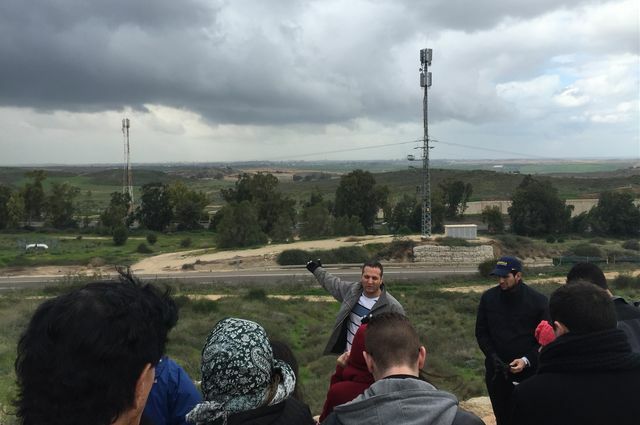 An Olive Tree Initiative group that includes UCLA students looks at the Gaza strip from the town of Sderot in Israel. Because it borders Gaza, the town has been severely damaged by rocket fire. The students also met with Palestinians who lost their homes in the war and now live in refugee camps. Robert Jackson and Denise Marshall each traveled a twisted and bumpy road to get out of troubled upbringings in South Los Angeles. Eventually it led them both to UCLA, where they are now fourth-year students majoring in African-American studies. Prime examples of how self-determination and hard work can beat seemingly insurmountable odds, Jackson and Marshall are about to set out on a new road. This one leads to places they never dreamed of seeing and people they never imagined meeting. They are now headed for ground zero of the Palestinian-Israeli conflict. 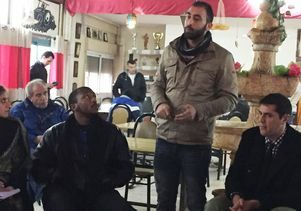 A resident of the Dheisheh Refugee Camp in Bethlehem talks to a group of students, including UCLA students Anthony Hardy (sitting to his left) and Saeed Marandi (sitting right). Jackson and Marshall are two of 10 UCLA students traveling to the Middle East later this month with the Olive Tree Initiative (OTI), a University of California-based organization that promotes understanding through immersion in the history, culture and complexities of the Israeli-Palestinian conflict. 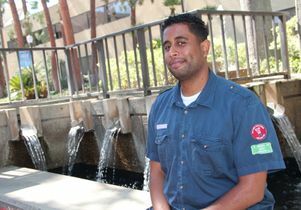 Begun at UC Irvine in 2007, the program seeks to facilitate conflict resolution by exposing participants to many voices on an issue that has generated tension on college campuses across the country. The initiative, with nine chapters on college campuses and more than 400 participants nationwide and in the United Kingdom, does not advocate for one side or the other, but requires that students respect the rights of all to voice their opinions. After months of rigorous academic preparation, candid discussions and reflection on campus, the group from the UCLA chapter of OTI will begin its journey on July 19, with a stopover in Washington, D.C. and New York to speak with diplomats at the State Department, the White House and the United Nations and other regional experts before heading to Jordan, Israel and the West Bank to hear from those whose lives are directly impacted by Israeli-Palestinian conflict. 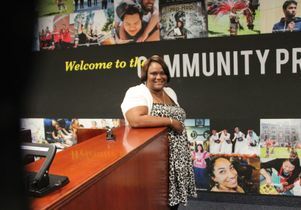 For Marshall, 39, a former gang member who served time in a juvenile detention camp for looting during the 1992 L.A. riots before steering her life in another direction, the OTI trip is a chance of a lifetime to experience another culture. 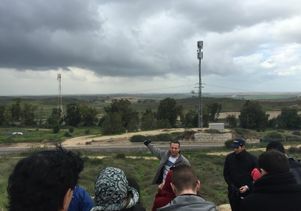 According to an activity-packed itinerary that is subject to change, the UCLA students will be traveling throughout the Middle East and meeting with government officials, journalists, academics, college students, soldiers and business leaders on both sides of the conflict as well as with representatives of organizations working to find a resolution. Students on the Olive Tree Initiative trip visit the Temple Mount/Haram al-Sharif in the old city of Jerusalem. The site has great religious significance for Jews, Christians and Muslims. “The kind of access OTI has is very, very special,” said Antonio Sandoval, director of UCLA’s Community Programs Office, who visited the Middle East with OTI earlier this year. 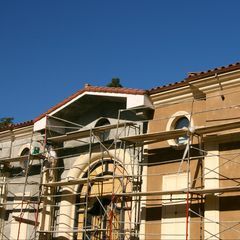 During that trip, the UCLA contingent was invited into the compound of the wealthiest industrialist on the West Bank to speak with him. “You go there with an open mind ready for open dialogue and open debate,” Sandoval said. At the frontlines of the conflict, the students will eat lunch with families living in Palestinian refugee camps, visit an Israeli city that’s been the target of rocket attacks, meet bereaved parents from both sides, hear from Israeli soldiers and speak with members of Palestinian security forces. The search for a deeper understanding will take students to places where they can see, touch and feel the impact of war as they travel to the Dead Sea, make the Beit She’an Crossing, and visit the Golan Heights, the Syrian and Lebanese borders, Nazareth, Haifa, Galilee, Jerusalem and many other important locations. Listening to viewpoints across the spectrum and talking with others who hold opposing opinions can be transformative for participants and build leadership qualities, organizers said. Christopher Nguyen, who went to the Middle East with OTI as a UCLA student last January before graduating in June, can vouch for that. 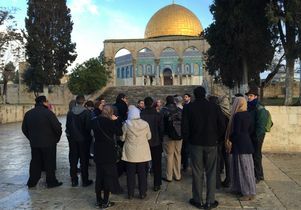 Students on the Olive Tree Initiative trip visit the Temple Mount/Haram al-Sharif in the old city of Jerusalem.